Today Polo in Barbados is a popular sport, played by international teams to a local home crowd and their supporters who visit with them, to a loyal local crowd of polo enthusiasts and tourists. Many overseas visitors now enjoy watching polo while on their Barbados holidays. 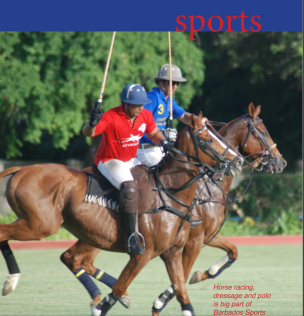 The first horse polo match in Barbados was played in 1884 according to the historical record. British cavalry officers brought the sport with them from Great Britain. It was a game that suited the Barbadian lifestyle where horses were part of everyday life, and a number of wealthy plantation owners had their own stables. Horses were the means of transport and communication across the land, and horses worked the land to help in cane harvest and sugar production. Polo was organized by the Polo Club which was founded in an ad-hock but professional manner by the cavalry and the landlords. Polo playing continued until 1929 when the Polo Club was suspended for 10 years. Restarting at the Garrison Savannah in 1939, the club and polo have been a going concern on this tiny Caribbean island ever since. The original polo club, BarbadosPoloClub.com , has overseen the development of three playing grounds in addition to the first one. Fields are at Holders, Lion Castle, Waterhall-Apes Hill and Clifton. International teams visit several times a year to challenge the Barbados team during the polo season which is January to May. British royalty, including Prince Charles, often visit Barbados to play polo. Sports tourism is becoming a major industry. Matches always draw large crowds with children being especially delighted by the spectacle, and by the majesty of the horses and the skill of the riders as the players and their horses charge up and down the field to score points by hitting the ball into goal. Originating in Persia, polo continued to be a sport played by many in Iran until the Iranian Revolution. Often called the Sport of Kings, polo is formally played in 16 countries. Despite its long heritage, it is not an Olympic sport. 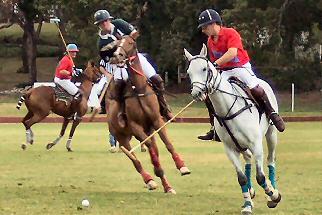 Two versions of polo are played today. The traditional form, field polo, has four riders per team and is played on a field up to 300 yards long by 160 yards wide. Arena polo, played in an arena, has a smaller field and sees three riders to a team. Play is divided in periods called chukkas. In Barbados, an 8-chukka match is played with each chukka being 7 minutes long. Riders charge up and down the field striking the small wooden ball, 3 to 3 and a half inches in diameter, with a long-handled mallet. Goals are scored by knocking the ball through goal posts. A rider must stay mounted for his goal to count. Making the sport even more astonishing is that the riders must control their mounts with one hand at a gallop while trying to strike the ball with their mallet. Contact the Barbados Polo Club at (246) 432 1802 for Barbados polo information.